A classic example of a roofpond application, the Atascadero House (Atascadero, Calif.) was designed with the assistance of Harold R. Hay and built in 1973. Photo credit: John Reynolds. Thermal mass is an essential component for any passive solar heating or cooling strategy. It’s useful because it absorbs solar energy and provides inertia against interior temperature fluctuations despite diurnal temperature cycles. Design teams can introduce thermal mass into projects in a number of ways. Baked clay, adobe and various types of stone have been utilized for their thermal mass since ancient times. Concrete and brick are contemporary favorites amongst today’s professionals. However, in recent years, several notable green building innovators have touted the outstanding thermal performance of water as a building material. Their claim is that water soaks up and distributes heat more effectively than any other type of thermal mass. 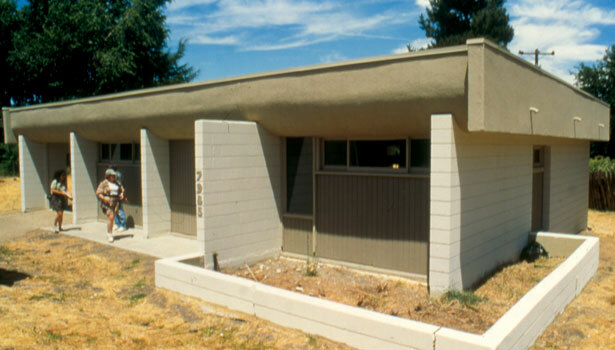 Thanks to solar pioneers such as Harold Hay, Steve Baer and Ken Haggard, there is a fairly extensive precedence for using water as a simple, static thermal mass in building applications dating back to the 1960s. Even the de facto arbiter of architectural design data and construction details, Architectural Graphic Standards, recognizes water-based strategies such as roof ponds and water walls as acceptable approaches to passively conditioning structures. Moreover, water is completely nontoxic, inherently fire-resistant, visually transparent, acoustically deadening and readily available throughout the U.S. at an extremely low relative cost (at least for the time being). Published research from various case studies using water as a simple, static thermal mass has demonstrated the potential of water as a thermal mass. The data suggests that water can be used to mitigate the extreme summer temperatures of Phoenix as well as the harsh winters of northern Indiana. What is unclear to many professionals is just how much better water’s thermal properties are compared to a more traditional thermal mass such as concrete or masonry. Given the abundance of available options, design teams are left asking: What is the ideal thermal mass? Is water truly better than concrete, adobe or brick? Can gypsum be a useful thermal mass if there is enough of it? To answer these questions, let us briefly consider the physics of thermal mass through a side-by-side comparison of gypsum, adobe, brick, concrete and water. Originally published in the October 2012 issues of Environmental Design Construction (EDC) magazine.